Saturday May 8th is the annual Long Night of Museums when over 40 city museums and cultural institutions open their doors to the public until the early hours. Many until 2am! Special events are happening all over town; one of the many highlights is an iphone concert by Kreidler at the NRW-Forum and light installation on the building facade. 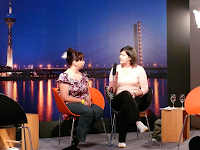 There will also be a live broadcast of all that is going at the NRW-Forum over the web and I have been asked to say a few words about RhineBuzz, you can watch this here. We are scheduled for between 8 and 9pm. The broadcast will go on until at least midnight, various people from the world of arts and culture will be interviewed, most of it will be in German, but our interview will be in English. The museum kunst palast also in the Ehrenhof, will be staging a vibrant program including a skate show in the courtyard, a huge painting event also outside with the aid of paintballs and amongst the varied exhibits inside the building you can enjoy a fabulous animated installation by Markus Vater, a piece he describes as a "walk-in painting." In contrast, in the Hentrich Glass Museum, in the building opposite you can admire some of the most exquisite paperweights you are ever likely to see. Real treasures! Tickets are €12 and allow entry to all exhibits and events and the use of shuttle buses that take you to the various venues. You can purchase tickets on the night at booths in the city and at all participating houses. The main bus crossroads is at Grabbeplatz which is outside the Museum K20 in the centre of town. Blue booklets which list all that is happening - and is too vast to list here - are available at all venues, ticket offices and the tourism office. It's a very busy night. Be prepared to queue and we really don't recommend you go in a big group! It was a great night! The Ehrenhof was the place to be with the iphone concert broadcasted on the building of the NRW-Forum, the fabulous Men in Blech who entertained regularly throughout the night outside mkp. For those that understand German read Feli's highly amusing report of what went on backstage at Museum TV that night on Felisworld.